“Ahhhh, how sweet,” you might say. 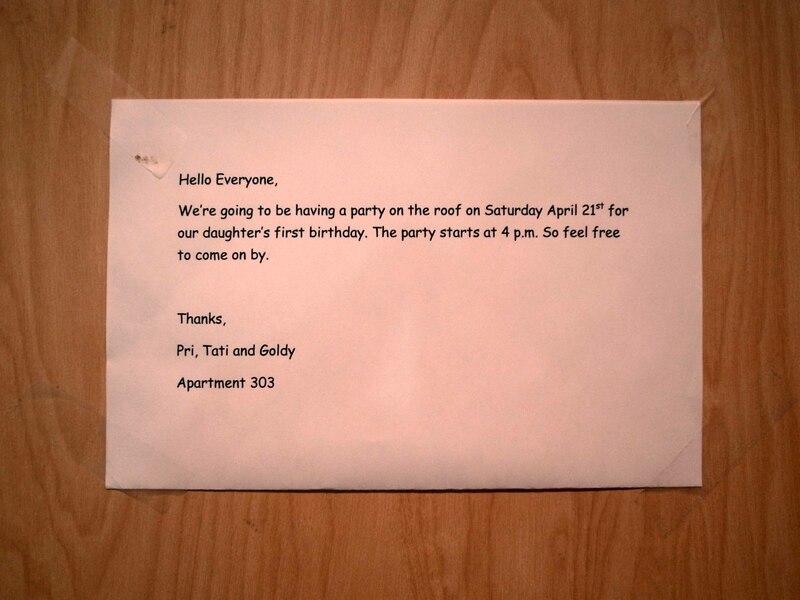 “You have adorable neighbors, and there will probably be cake too.” Perhaps, perhaps. But if you are living with level 9 paranoia, like myself, a more accurate reaction to this carefully crafted apartment elevator invitation would be, “Oh sure, let me come up to the roof around four so you can know that I’m no longer in my apartment, and can then signal a friend on the street, letting them know my unit is currently ripe for the cat-burglaring.” Or you might wonder aloud to yourself, as I did, if Pri, Tati, and this Goldy person are actually assembling everyone on the roof for a mass cult suicide jump – there might still be a party, and maybe the roof jump isn’t scheduled for this Saturday, but pulling all the neighbors together with cake and ice cream to discuss their Heaven’s Gate style plan isn’t the worst ploy. A lesser thought, let’s call it level 7, might simply be, “Hmm, what a great way to get a bunch of free toys for this Goldy character.” It could just be they are the neighborly sort, but my money is on poisoned Kool-Aid.